There are 28 Assisted Living Facilities in the Bluffton area, with 2 in Bluffton and 26 nearby. The average cost of assisted living in Bluffton is $2,900 per month. This is lower than the national median of $3,346. Cheaper nearby regions include Port Royal with an average starting cost of $2,500. To help you with your search, browse the 206 reviews below for assisted living facilities in Bluffton. On average, consumers rate assisted living in Bluffton 4.1 out of 5 stars. Better rated regions include Hilton Head with an average rating of 4.4 out of 5 stars. Caring.com has helped thousands of families find high-quality senior care. To speak with one of our Family Advisors about assisted living options and costs in Bluffton, call (855) 863-8283. Bluffton, South Carolina is an eastern shore coastal community located adjacent to Hilton Head. Assisted living communities here, as in all of South Carolina, are commonly referred to as assisted living residences, or ALRs. Within Bluffton, there are two ALRs and an additional 24 in neighboring communities such as Hilton Head and Port Royal. Room and board and varying levels of personal care and activities are provided to aging seniors in the assisted living communities. ALRs in Bluffton and surrounding South Carolina areas are regulated by the South Carolina Department of Health and Environmental Control and supported by the Division of Licensing. The Bluffton crime rate is notably lower than the South Carolina state average with violent crimes scoring nearly 8 percent lower than the national average. This could be an incentive for seniors who are looking for the security of a low crime rate. Living in Bluffton will cost seniors a bit more than in other parts of South Carolina. The cost of living in Bluffton is 16 percent higher than the South Carolina average with the cost of housing being the biggest factor in the cost of living difference. The higher cost of living may be a consideration for seniors who are looking for an affordable lifestyle. Although air quality measurements are not specific to Bluffton, the air quality throughout South Carolina is above average as compared to the national average. Seniors with respiratory concerns may want to consider South Carolina as a great place to breathe clean air. Sperling's Comfort Index ranks Bluffton 85 on a scale of 100, indicating that Bluffton has a considerably more comfortable year round climate than most other locations throughout the country. This may interest seniors who enjoy outdoor activities. 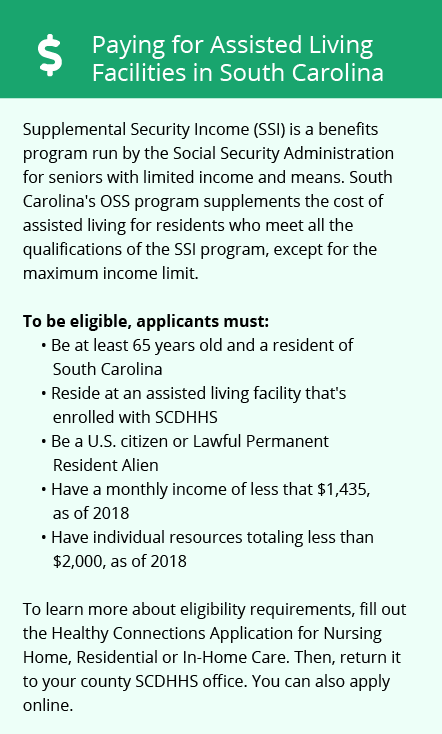 Bluffton seniors can take advantage of the fact that South Carolina does not tax Social Security retirement benefits and has a $15,000 deduction for seniors receiving any other type of retirement income, leaving more money in seniors' assisted living budget. South Carolina does have an above average income tax rate at 7 percent. Bluffton is home to world-class medical facilities, including, Hilton Head Hospital and Bluffton Medical Services, in the event of medical emergencies or illness. Assisted Living costs in Bluffton start around $2,900 per month on average, while the nationwide average cost of assisted living is $4,000 per month, according to the latest figures from Genworth’s Cost of Care Survey. It’s important to note that assisted living rates in Bluffton and the surrounding suburbs can vary widely based on factors such as location, the level of care needed, apartment size and the types of amenities offered at each community. 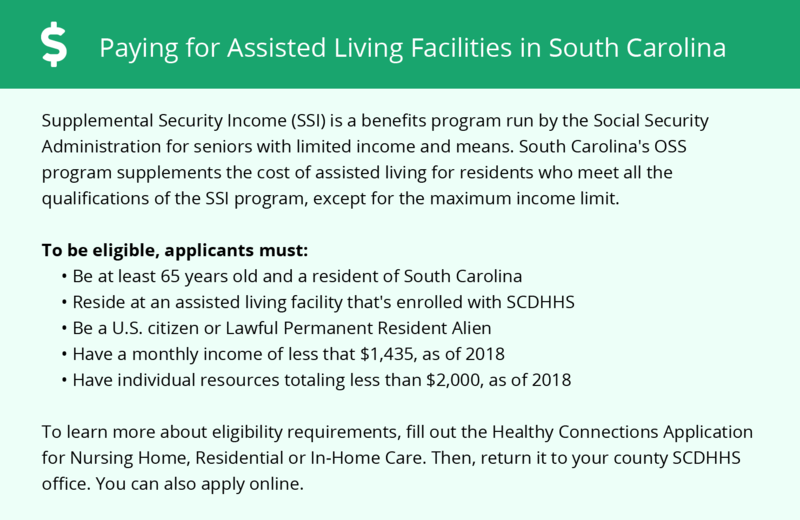 Eligible seniors in the Bluffton area in need of financial assistance to pay for assisted living can apply for the Community Choices Medicaid Waiver. Learn more about these programs, plus who’s eligible, on our Assisted Living in South Carolina page. For more information about different ways to finance assisted living, visit our Assisted Living in South Carolina page. Bluffton and the surrounding area are home to numerous government agencies and non-profit organizations offering help for seniors searching for or currently residing in an assisted living community. These organizations can also provide assistance in a number of other eldercare services such as geriatric care management, elder law advice, estate planning, finding home care and health and wellness programs. To see a list of free assisted living resources in Bluffton, please visit our Assisted Living in South Carolina page. Bluffton-area assisted living communities must adhere to the comprehensive set of state laws and regulations that all assisted living communities in South Carolina are required to follow. Visit our Assisted Living in South Carolina page for more information about these laws.